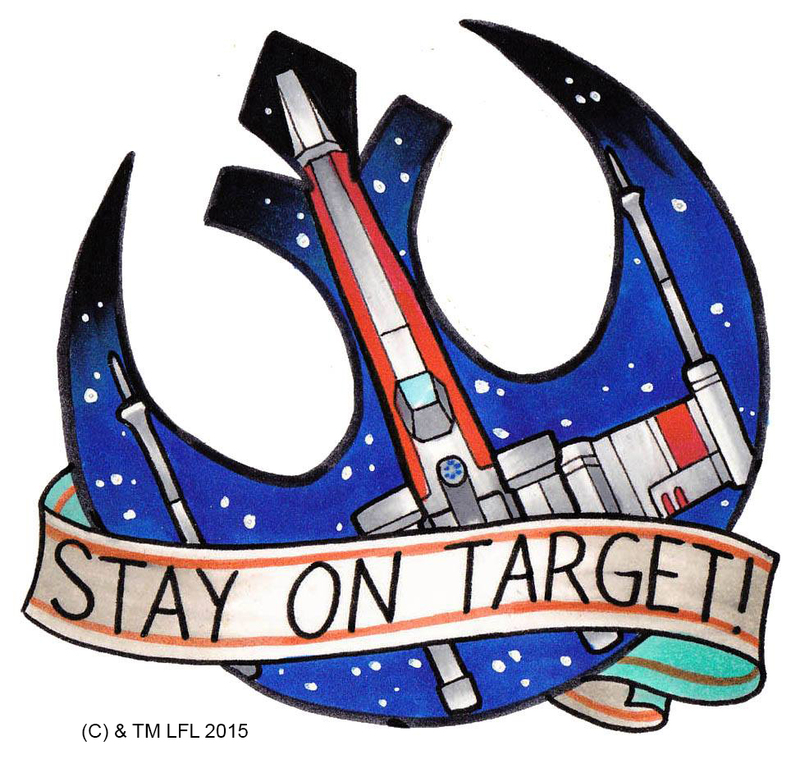 The Star Wars Tattoo Pavilion will be fully armed and operational this week! When I organized the very first Star Wars tattoo track for Celebration III way back in 2005, I had no idea that over the next 10 years we would continue to grow what was originally a very niche segment of fandom into one of the most popular attractions at the event! 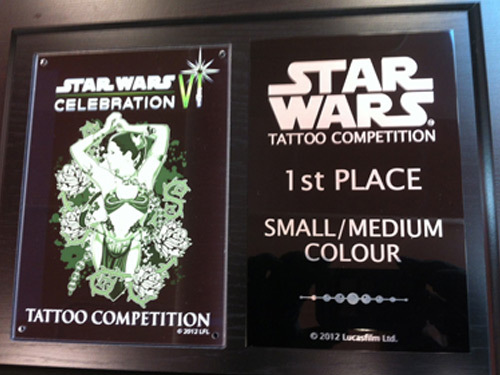 That first year we had a small booth showcasing some wonderful paintings and flash art from some of the pioneering artists in the Star Wars tattoo world, and we also held our first-ever Star Wars tattoo competition. 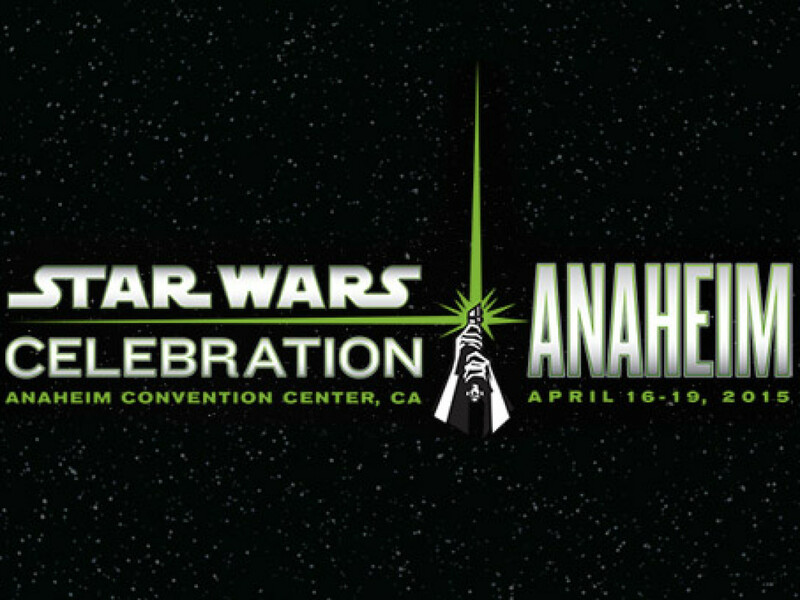 While the booth and competition that year proved more popular than I expected at the time, I certainly never imagined that a decade down the road we’d still be going strong and preparing to unleash what is, hands down, the largest and most exciting Star Wars tattoo-related programming ever seen at Celebration! So just what do we have in store? Allow me to elucidate! The Artists! First and foremost, Ink Fusion’s Marc Draven and I have brought together nearly 50 (yes, you read that correctly – five zero) of the world’s best and highest profile tattoo artists/Star Wars fans who will be on site, slingin’ ink, talkin’ nerdy, and givin’ attendees the ultimate Celebration souvenir! All of the artists who will be at the event have been hand-picked by Marc and myself and are pre-registered with the California Board of Health, who we have worked with to ensure a clean, safe and approved Tattoo Pavilion for all! 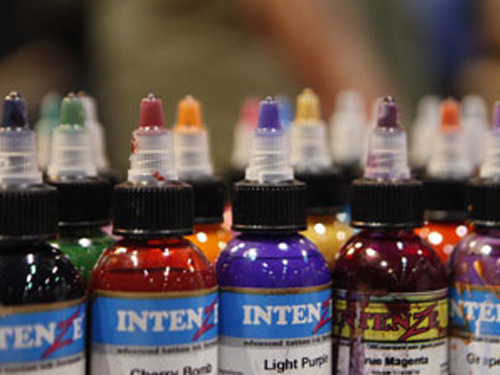 With so many artists at the show you can rest assured that all styles of tattooing will be represented — from traditional to portrait realism and everything in between! If you’re interested in getting a tattoo, big or small, at Celebration, it’s important to know that walk-ups may be possible with some of the artists, but many are quickly booking in advance. So have a look over the list to see who’s artistry you like the most and drop them a line to discuss any ideas you might have! The Competition! Since it’s introduction at Celebration III in Indianapolis, the Star Wars tattoo competition has become one of the must-see Celebration events! Taking place on Sunday from 1-2:30 p.m. on the Behind the Scenes Stage, hosts Jimmy Mac and Jason Swank introduce the audience to some of the most decorated Star Wars tattoo collectors this side of the Outer Rim Territories as they showcase the best of their body art in five different categories: Small/Medium Color, Small/Medium Black & Grey, Large Colour, Large Black & Grey, and Tattoo of the Weekend! Each contestant will have their tattoos projected on the big screen for all to see before showing off their entries to our panel of special guest judges: heavy metal frontman Rob Dukes from Generation Kill, Chris 51 from TV’s Epic Ink, CB Cebulski from Marvel Comics, and myself, Shane Turgeon, author of The Force in the Flesh Volumes I and II. 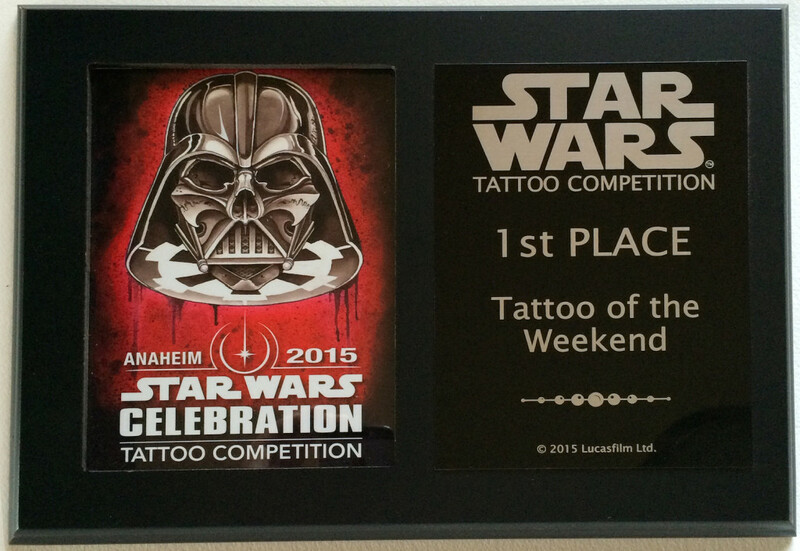 Winners and runners up will receive exclusive Star Wars Celebration Tattoo Competition awards — easily the some of the rarest Celebration exclusive items at the show! *Note! Contestants must pre-register for the event before close of show on Saturday. No late entries will be permitted and due to time constraints no symbols (Rebel, Imperial, Jedi Order, Fett skulls, etc) will be permitted to enter. 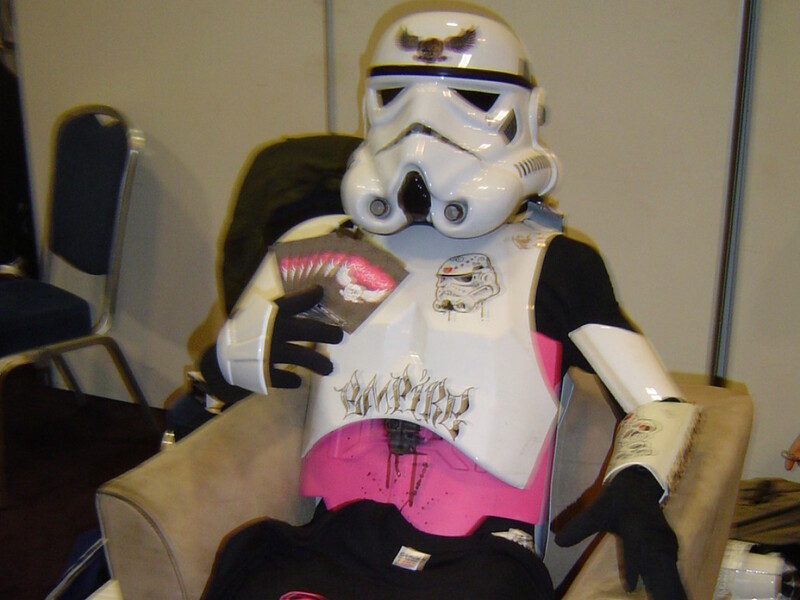 Registration takes place at the Force in the Flesh booth in the Tattoo Pavilion during regular show hours. The Book! I’m incredibly excited to release the highly-anticipated sequel to The Force in the Flesh: Star Wars Inspired Body Art at Celebration Anaheim! 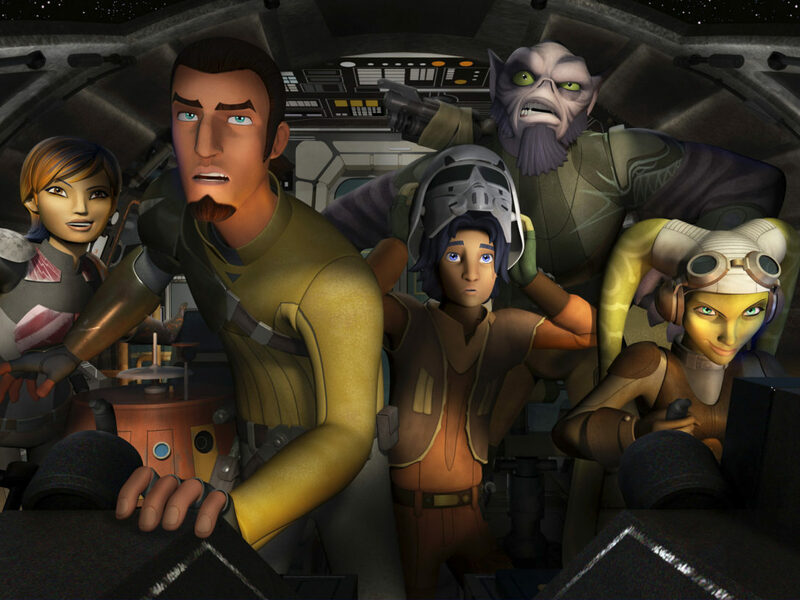 It’s been eight years since Volume I was released at Celebration IV in Los Angeles and in that time, not only have Star Wars tattoos become a mainstream part of Star Wars fandom but the quality in artistry has exploded in the industry, as well. 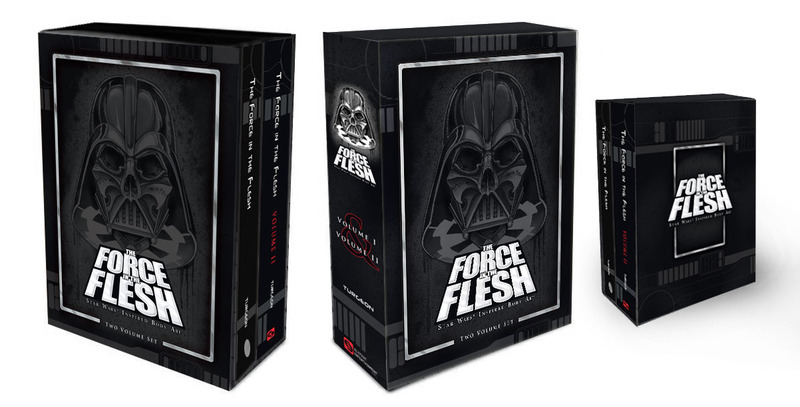 As a result The Force in the Flesh Volume II is a lot bigger and better! Coming in at a whopping 312 pages (100 more than the first volume), this embossed hardcover book features 20 different tattoo collectors, over 40 artists (many of whom will be tattooing at our Celebration Tattoo Pavilion and who will happy to sign copies of the book) and over 1,000 individual photos! It’s a massive tome and with a foreword by Stephen J. Sansweet, it is a must have for any fans of Star Wars tattoos and/or great Star Wars artwork. In addition to the regular edition of the book, we will also have an incredibly limited edition slipcase set of both the long out-of-print Volume I and the new Volume II. This set is strictly limited to 150 copies and comes with a set of prints done by featured artists Matt Difa, James Woodford, Kirk Douglass, Michael Bogle, and Luis Villagomez, as well as an author plate signed by cover artist Adam Hays, designer Jeff Correll, and myself. If you missed out on Volume I, this is now the only way to secure a copy for yourself! I will be on hand all weekend to sign copies of the book and we will have special guest signings by designer Jeff Correll, Generation Kill frontman Rob Dukes, and the cast of TV’s Epic Ink! The Exclusives! What would a Celebration be without exclusives? In addition to the awards and the special slipcase book set mentioned above, we have some fantastic items that will only be available in the Tattoo Pavilion this Celebration! Shirts! Artist George Joseph has designed two killer Ink Fusion Star Wars tattoo shirts which are limited to only 75 of each design! Temporary Tattoos! 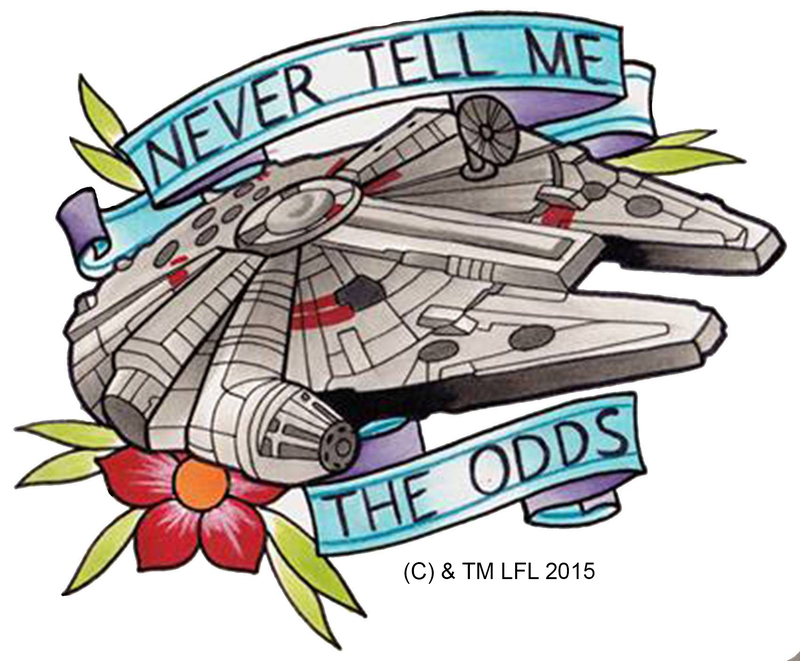 You have to be over 18 to get tattooed at Star Wars Celebration but we know the little ones love tattoos too! So that’s why we had artist Joshua Couchenour design two exclusive temporary Star Wars tattoos for those who want to rock some Star Wars ink — without the permanent commitment! Prints! 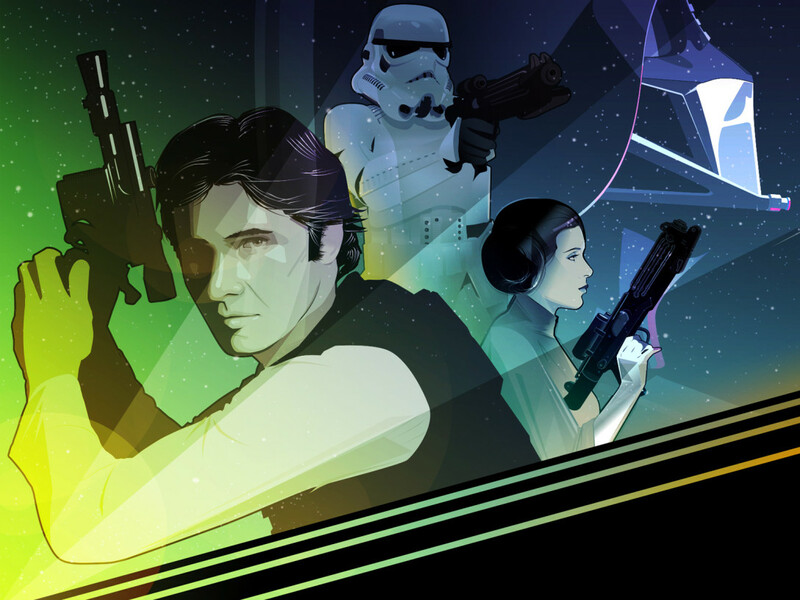 The Force in the Flesh will be offering a very limited set of prints featuring the cover art to the book. Strictly limited to an edition of 25, these hand-numbered, 17 x 21” giclees are printed on 100% cotton, 320 gsm, cold press, Hahnemuhle paper, and feature a gold seal on the reverse. Temporary tattoo by Joshua Couchenour. 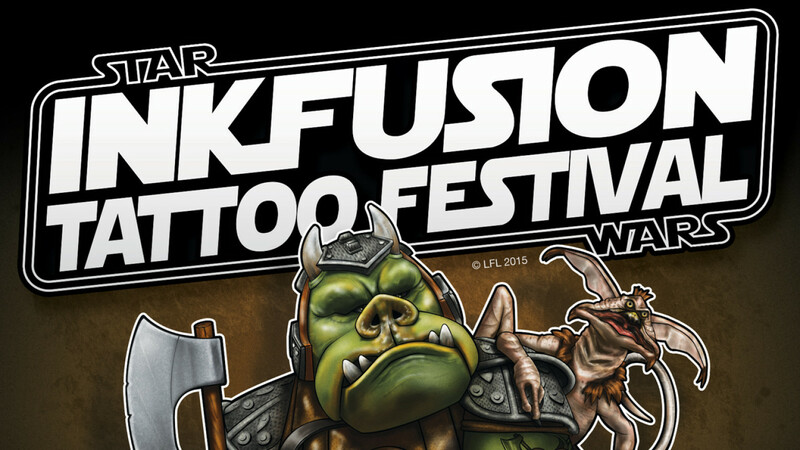 I’m sure you’ll all agree that we’ve pulled out all the stops for this year’s event and that this is, by far, the greatest Star Wars Tattoo Pavilion ever unleashed on a Celebration! 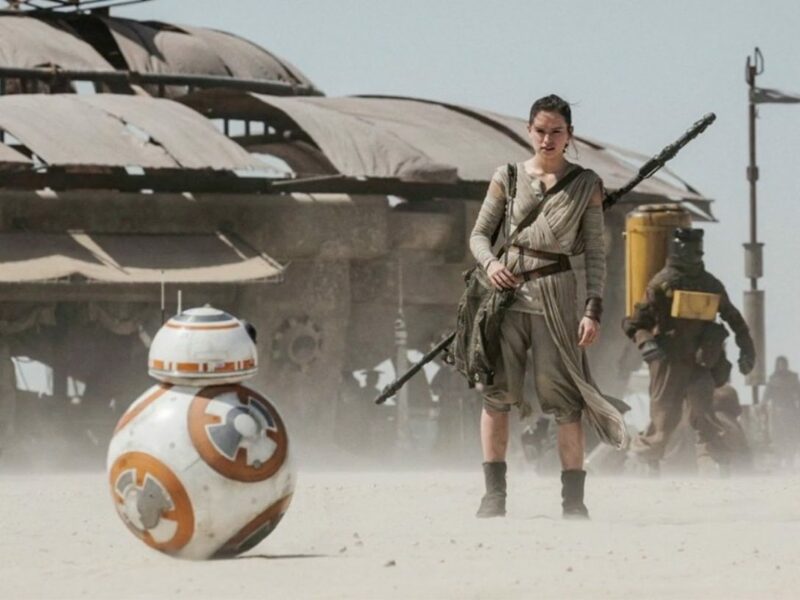 Star Wars may very well be forever, but Star Wars tattoos are for life — and that’s a much more permanent level of fandom! 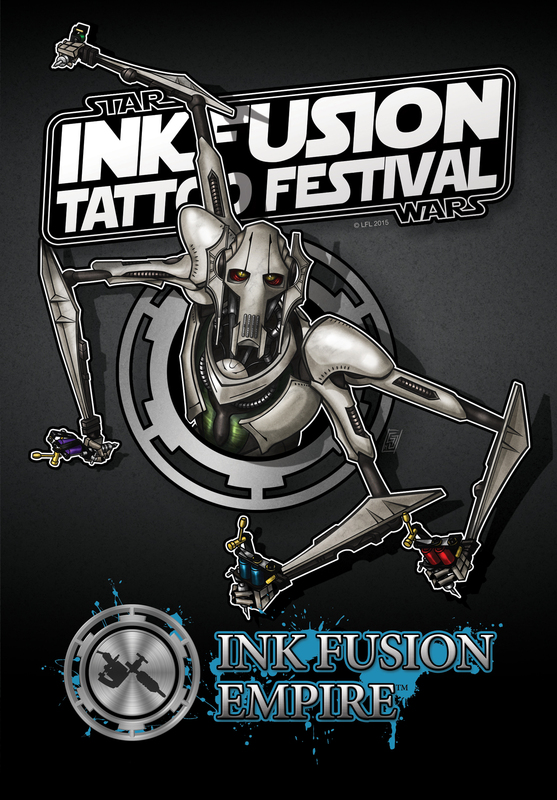 Stay up to date with all of our latest Celebration news and announcements by following us on Facebook (starwarstattoos and inkfusionempire) and Instagram (theforceintheflesh and inkfusionempire)!